Let us remember with thanksgiving the life and service of Eleanor R. (Ellie) VerNooy, widow of the Reverend David P. VerNooy (d. 12/22/12). Ellie died at home on February 11, 2015 at 81 years-of-age. 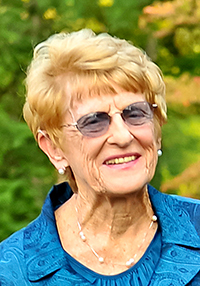 Her career spanned many years as a NY State middle school science teacher and a social worker. After retirement, she was active with local charities, and visits with her grandchildren. She and David enjoyed traveling including four mission trips abroad to Haiti, Ireland, Bolivia and Guatemala. She loved her family, dancing, beaches and her cabin in the Pocono Mountains. Ellie is survived by four children; Linda VerNooy and her husband A.M. Noel, Diane Gallagher and her husband Daniel, David VerNooy and his wife Nancy and Crystal Mayer and her husband Frank, nine grandchildren; Gwendolynn, Jason, Rebecca, Michael, Katherine, Saraswati, Brittany, Stephanie and Jeevan, and one great-grandson James, as well as several nieces and nephews. A grandson Ryan VerNooy, her brother Donald and a sister Janice predeceased her. A memorial service was held February 14, 2015 at Christ United Methodist Church, Beacon. Donations in Eleanor VerNooy’s honor may be given to the General Board of Global Missions, 475 Riverside Drive, New York, NY 10115 or Habitat for Humanity, 125 Washington St. Newburgh, NY 12550.